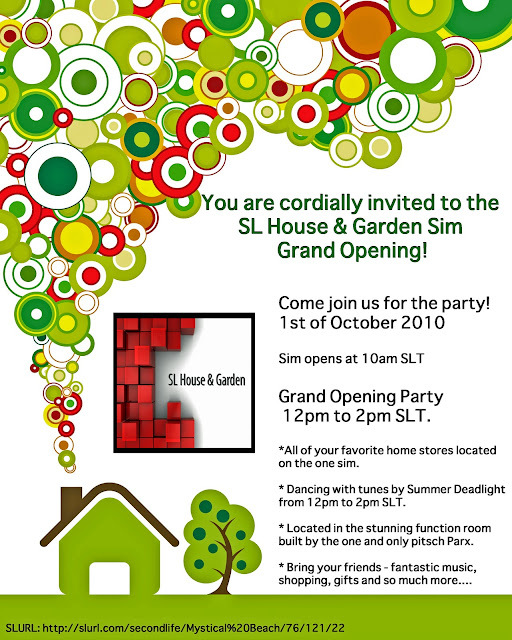 SL House & Garden: SL House & Garden SIm Grand Opening! If you would like any information or an invite inworld - please contact Jennaa Loire. Visitors to the SL House & Garden Sim can expect to see a venue dedicated to everything home, furniture, garden and decor. There will be a fantastic array of shops featuring the very best home and decor creators from accross the grid. There is more 'showcase rooms' featuring home and decor creators each offering an exclusive item for visitors to the sim, as well as a room for interior designers and bloggers each demonstrating different ways of creating a look for your home. There is also a new texture trend showroom.....a first for SL! This showroom displays some amazing and unique textures and shows you how to work textures together. Visitors will also have a relaxing gallery and cafe to enjoy which features home decor and garden photography of group members. There is also a terrific display of the winners of the SL House & Garden Group monthly photography competition. Not to mention, a spectacular and diverse sim built by pitsch Parx that is simply breathtaking. Second Life furniture, garden, home and decor is a dynamic and ever growing industry that I am truly entusiastic and passionate about. I have tried to keep up to date with product releases and all the incredible changes within this field, but I found myself juggling over 20 groups and quite simply, failing to succeed. Shop owners, designers and creators (textures, building components and builder's aids are more than welcome as well) can join the group to boost sales and to communicate your products and creations to the enthusiasts and GET NOTICED, there is no cost at all involved! 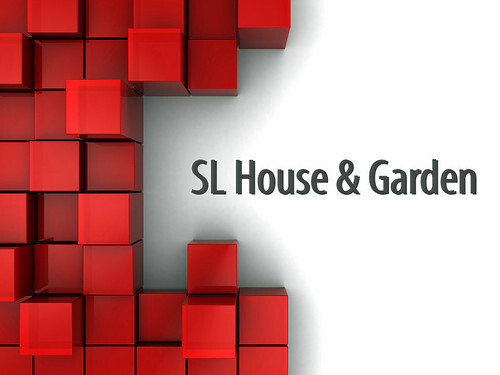 If I have raised an eyebrow, go to groups and search "SL House & Garden". I created this special location for group members and other guests as a place to come and relax, shop, blog, build their creations and to generally be a helpful tool for all home, decor and garden lovers of SL. There is a warm and inviting cafe and gallery where you are welcome to socialise with other enthusiasts or simply enjoy some 'down time'. This can be used as a resource room which is the perfect spot to sit down and relax while you blog. You can check out the latest SL House & Garden photo contest winners in the gallery while you are there. We are very fortunate to have many wonderful creators on the sim. Make sure to stop in and check out their amazing creations. I also have an office on the sim where you can stop by and contact me in many different ways. There is also a suggestion/comments box where you can send me any ideas/comments you may have. Please treat this place as you would your home... please please be respectful of other visitors and if you have any issues please contact Jennaa Loire. There is the "Textrure Trend Forecast" room just near the landing point. For the new SL House & Garden sim pitsch and I had the idea to showcase some of SL 's best textures artists around, and make a room only for textures, the "Texture Trend Forecast" room. Here you can pick up free textures, see how to work them together and get inspiration for your next project. These will change every 6 weeks. They will be themed and work from there. Jennaa Loire and Pitsch Parx will make themes and make textures groups within those themes. Make sure you stop there... have a look and pick up your free textures. Designers are often faced with the challenge of marketing their products without the big ticket expenses of owning and operating a store in SL. In an effort to help their dilemma and to display some terrific items to visitors of SL House & Garden Centre & group, I have created 3 display rooms. There are 2 display rooms on this sim. These display areas will be rotated through the designers in the group and changed every 4 weeks. This is a fantastic way for well-known and aspiring creators to generate interest in their designs, and for home and garden enthusiasts to access a variety of products in one place. If you an enthusiast, this is an opportunity to get to know some of the popular and lesser known designers within SL. The creators will also have an exclusive item available for purchase during their time at the SL House & Garden Centre. Make sure you head on over to their display rooms and pick their items up. Interior decorators and bloggers are often faced with the challenge of displaying their work inworld. SL stores generally feature creators, designers and retailers but there is no opportunity for decorators and bloggers to display their creativity. The SL Home & Garden Sim has created a showroom especially for interior decorators and bloggers to demonstarte their ability and imagination. Visitors of the centre can see their amazing work upclose and creators can browse the showroom and be inspired to send future review items to the tenants. This showroom area will be rotated every 4 weeks through the interior decorators and bloggers in the group who wish to use it. This is a fantastic way for well-known and aspiring decorators/ bloggers to generate interest in their work and give their followers and real-life, 3 dimensional presentation of their conception. If we can help you at all.. please don not hesitate to contact us.